Galata Bridge is an impressive landmark in the heart of istanbul: It spans the Golden Horn from Karaköy in the north to Sultanahmet on the south. When you cross the bridge, if you look westward you are looking at Europe; when you turn east you are looking across the Bosporus towards Asia. Istanbul is the only city in the world that is situated on two continents. 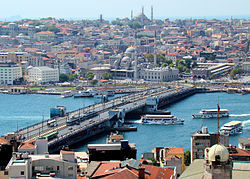 The present Galata Bridge was completed in 1992. 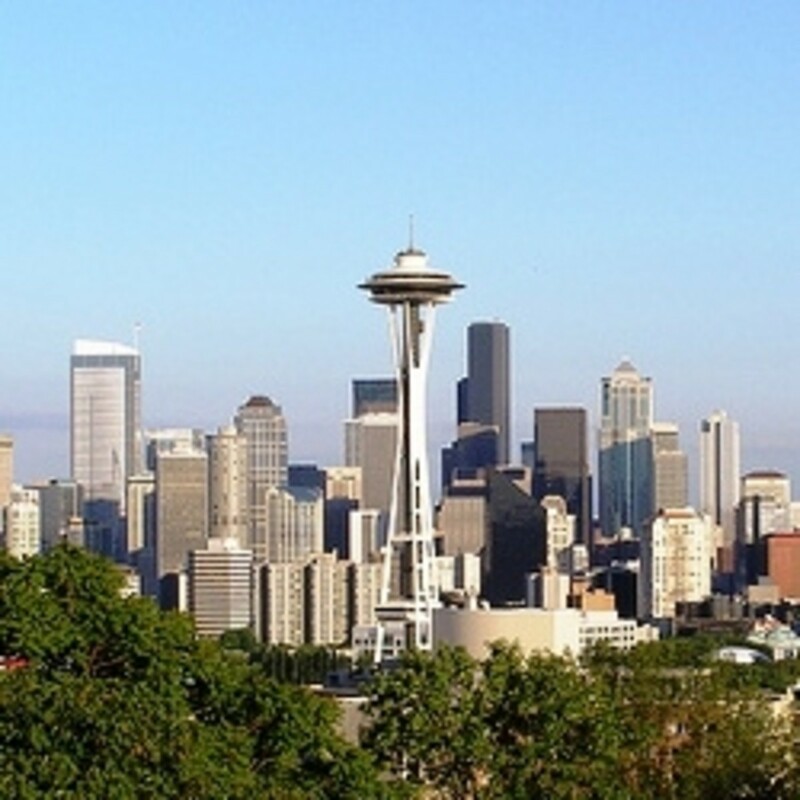 It replaced a beautiful pontoon bridge that dated from 1912, but was unable to handle large amounts of traffic. In 1503, Sultan Beyazid II commissioned the brilliant artist and architect Leonardo da Vinci to design a monumental construction to span the Golden Horn: This was only half a century after the city was claimed from the Byzantines. It is said that da Vinci completed the design, but his creation was never built: if it had been, it would have been the longest bridge in the world at that time. 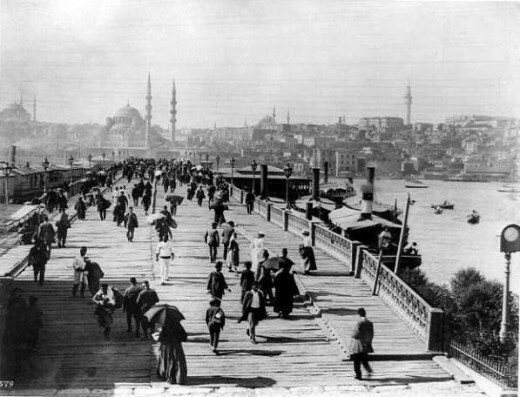 Galata Bridge is a concrete construction built on two levels. 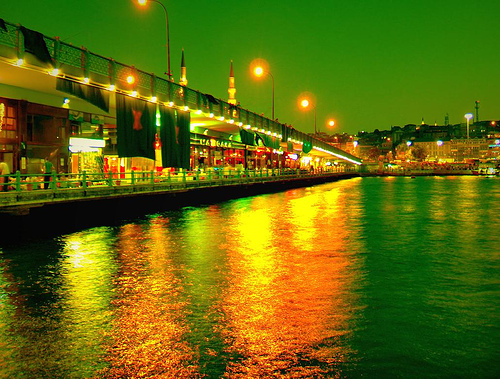 The lower level of Galata Bridge is extremely lively and lined with cafes, bars and restaurants, while from the upper level you can enjoy panoramic views of the old town of Istanbul; which is especially breathtaking when the sun goes down. 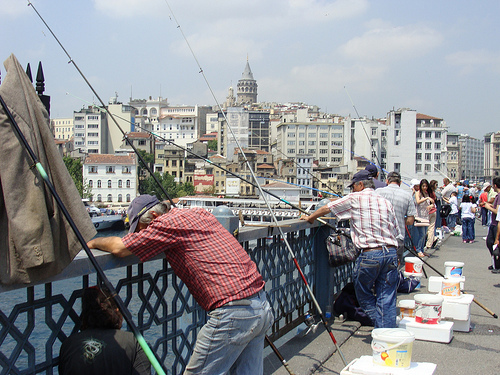 Every day hundreds of local Turkish fishermen line the Galata Bridge in a bid to catch the biggest fish. Their catches are sold to the restaurants on the bridge, so you can be sure you will be eating fresh seafood when you dine there. Watching the fishermen casting their lines then waiting for the fish to bite can be as entertaining as any other activity available on the bridge, and they seem to have the act of entertaining tourists combined with catching fish down to a fine art. The restaurants on the lower level of the bridge tend to be fairly expensive, and some say overpriced. Therefore, if you are on a budget you should buy from the food vendors on the upper level of the bridge. Simply walking along Galata bridge is pleasurable for the views: You have an excellent view of the Bosphorus canal on one side, and you can also see Istanbul's old town. Sunset is a great time to stroll along the bridge when the Istanbul skyline is silhouetted against the darkening sky. Stop at one of the many bars or cafes, and sample a cool drink; this is one of the numerous pleasures you can enjoy on a visit to the fascinating city of Istanbul.